ancient malt and ale : what's the archaeological evidence for malt? what's the archaeological evidence for malt? This is something that I became more and more interested in, once I had completed and submitted my thesis. How does an archaeologist or an archaeobotanist recognise whether or not a grain is malted? What happens inside the grain on the malting floor? I had access to the University Library for a few years after my degree - by teaching archaeology classes in the Continuing Education Department. I explored sections of the Library that, perhaps, no archaeologist had visited before. I studied grain germination physiology, biochemistry and discovered that Bewley and Black's classic study of seed germination was the best. Malting is an important craft and technology. The main reason for making malt is to brew with it, or more specifically, to make an ale or beer from the wort. Malt is also the main ingredient for whiskey, of course, but I am most interested in malt and ale in prehistory and its' role in the origin of grain agriculture. Apart from grain barns and malting floors, it seems that the best archaeological evidence for malt lies within the grain itself. There are clear physiological indications, depending upon whether the grain is desiccated (dried) or carbonised (charred). Carbonised or charred grains are frequently found in archaeological excavations from the neolithic, when people first began to cultivate and process grain, right through to the medieval era and beyond. Carbonised grains are found all over northern Europe. Is it evidence of a grain store or granary that has been destroyed by fire? This was suggested in interpretations of excavations of an huge rectangular timber building at Balbridie, Fife, Scotland where thousands of carbonised grains were found? Perhaps the grain dryer in a barn caught fire, while they were drying the harvested grain or oats. Or was it a kilning of the malt, which has gone disastrously wrong? Lots of grain barns have burned down over the years, as well as traditional malthouses. It's not an unusual event. Even in recent times, as late as the 1960s, malthouses have been known to catch fire. Carbonised grains were found at Eberdingen-Hochdorf, where there were the remains of Iron Age malting and brewing. This Iron Age site was excavated by Professor Hans Peter Stika between 1989 and 1993. According to the excavation report, it was a high status site, probably the rural residence of a prince. The carbonised grains, a huge number of them, were found in a sort of U shaped ditch, together with bits of charred wood. The interpretation was that as the malt was being dried, the fire had got out of control and set fire to both the wooden platform upon which the malt had been laid, as well as carbonising all the malt. The charred grains were mostly barley. Many of them had missing embryos and the grain was in poor condition. "In spite of favourable conditions for the preservation of seeds in the sediment, which was rich in ash, charcoal and generally carbonised plant material, the grains are corroded and highly fragmented. This fairly poor preservation seems rather specific to the barley grains from this sample. Conditions are therefore not suitable for a satisfactory observation of all the morphological features of most of the grains. However, the best preserved specimens allow the assessment that slightly more than 90% of the grains were sprouted when carbonised. This is easily visible from the groove like channel on the dorsal side of the grains. As far as we can see, the sprout length is not perfectly uniform, but it generally reaches about two thirds the length of the grain. It's beginning to get a little bit technical here and, perhaps, a good time to explain some of the grain germination jargon. There is a lot of it, so I shall stick to the basics. The fundamental biochemical processes and the physiological changes of grain germination occurred in ancient grains just as they do today, in modern grains. It doesn't matter whether you make malt 10,000 years ago or 5000 years ago or 10 minutes ago, the biochemistry of grain germination remains the same. Grains are a lot plumper than they used to be, because of selection and development by farmers over the millennia. 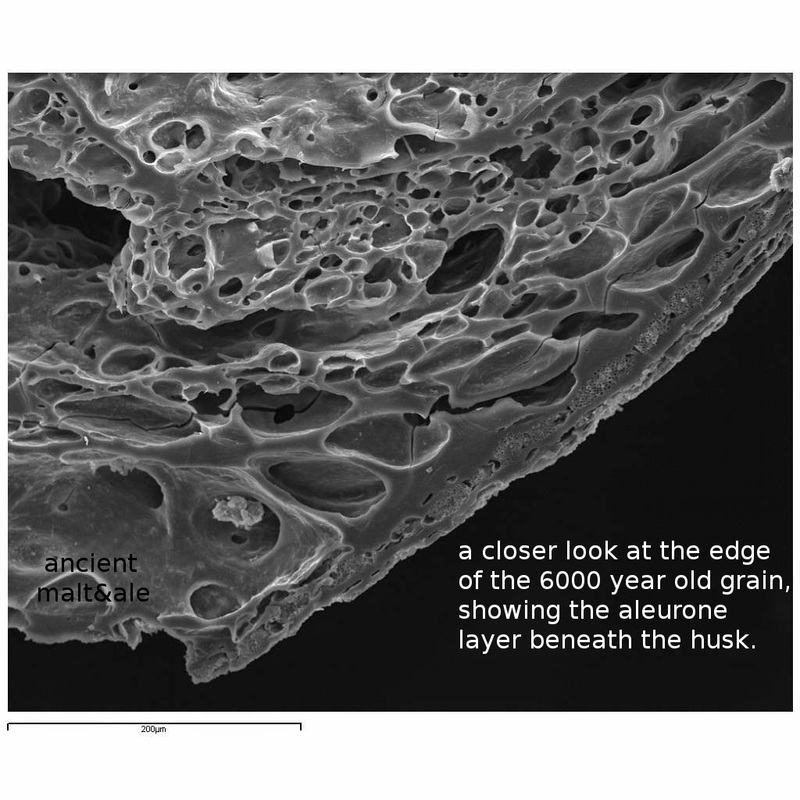 The aleurone layer, a special layer of cells just beneath the husk, is three or four cells in depth in modern grains, rather than the one or two cells in ancient grains. The structure of ancient cereal grains was studied by Professor Geoffrey Palmer, who looked at 3000 year old grain from Amarna, Egypt. 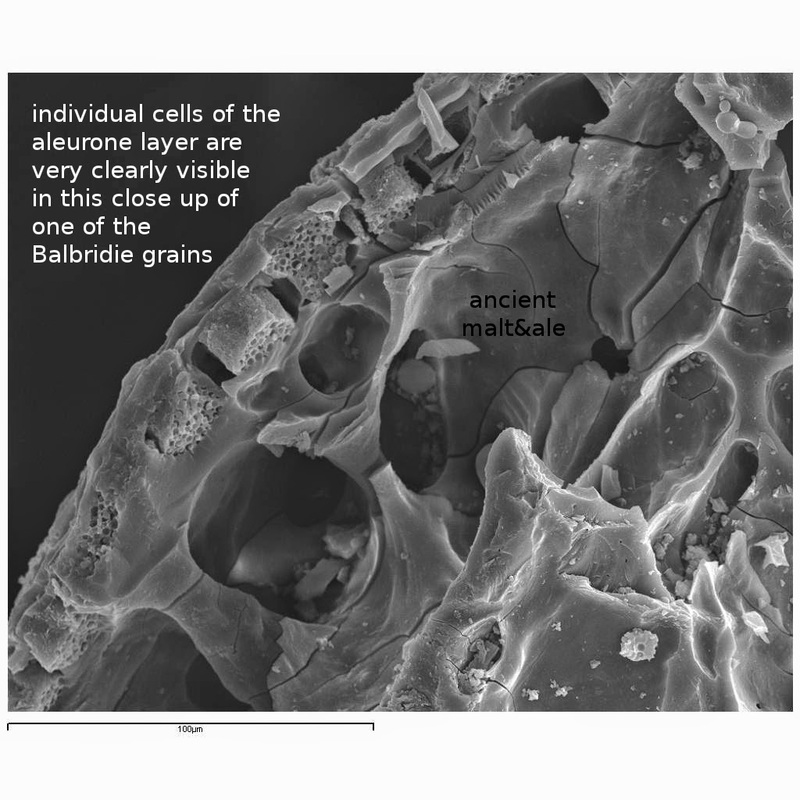 Using a scanning electron microscope to investigate ancient desiccated grains, he found that the internal structure remained intact. Individual starch granules within the endosperm could be seen with little holes or pits, where the enzymes had begun to convert grain starch into sugars. There are lots of wonderful scanning electron microscope images in his paper. Carbonised, or charred grain is found on many archaeological sites in Northern Europe and the British Isles. The matrix of charred or carbonised grain has been destroyed by heat of the fire, so it is not possible to look at individual starch granules. Although carbonised grain is often used just to provide a radiocarbon date for the site, there might be other clues for the archaeologist and archaeobotanist that reveal what kind of grain processing techniques were taking place. Such as separated embryos, fragmentation and friability. what happens on the malting floor? Barley, wheat, oats, sorghum and rye can all be malted. I hope these diagrams of grain and malt will help to explain how the grain germinates. This is how it works at a basic level. When the grain has been sufficiently steeped and aerated in water, growth hormones (gibberellin) are activated in the scutellum and embryo. These growth hormones stimulate the production of enzymes in the aleurone layer, which is a thin layer of special cells, just beneath the husk. The maltster knows, through skill and experience, when the grain is sufficiently steeped. The wet grain is transferred to the malting floor, where it is piled up, then gradually raked out into a bed, a few inches deep. Here it begins to germinate. When rootlet and shoot are about one third the length of the grain, it is called green malt, and the next stage is to carefully dry it. Biochemical changes occur within the grain as it germinates on the floor. The enzymes that were activated within the aleurone layer begin to convert grain starch into sugars, the initial food source for the growing grain. These are the same enzymes that re activate in the mash tun and make a sweet mash. Other enzymes break down the husk, making the grain friable and, therefore, easier to crush than unmalted grain. Malt, therefore, is made up of mostly starch, with a few sugars and, most importantly, those dormant starch converting enzymes that re activate in the mash tun at the right temperature. Grain germination has a complex biochemistry. Scientists still don't fully understand how the aleurone layer works. If you want to know more detail, have a look here. If you want to read even more detail, have a look here, at chapter 14 of 'Barley: production, improvement and uses' by Steven Ullrich. Or get hold of a copy of Bewley and Black. The products of brewing are ephemeral. Malt goes into the mash tun. Wort is fermented into ale which people drink and spent grain is fed to animals and waste liquid is washed down the drains. For the maltster and the brewer, it is a tragedy if the grain barn is destroyed by fire while the malt is being dried. For the archaeologist and archaeobotanist, it is a wonderful thing because the grain is carbonised and it is therefore preserved for analysis. Straight off the malting floor, it is called green malt. The maltster stops the growing process by gently drying the malt in a kiln. Gentle heat does not destroy the enzymes. Warm air passes through the malt, usually over several days. Traditional grain drying kilns do not have a solid floor. The malt is put upon a permeable floor to dry, so that warm air passes through the grain bed. Making good malt is a skilful task. Today, maltsters produce a variety of types of malt by kilning at different temperatures. Base malts are kilned at lower temperatures. The enzymes are not destroyed and will remain active in the mash tun. Specialty malts are kilned at higher temperatures, destroying the enzymes. These provide only colour and flavour to the beer, making up no more than 10% of the grain bill in the mash tun. Specialty malts have been developed over the last two hundred years, making a wide range of beers possible from pale ale to dark stout. I spent a few years making funding applications, hoping to continue my research into the archaeological evidence for malt. 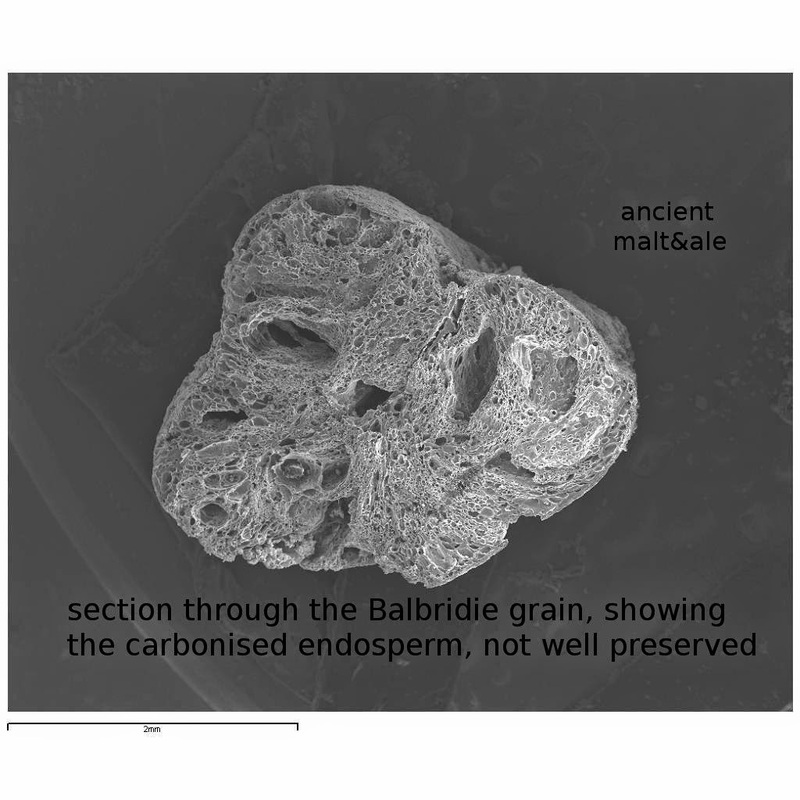 That never happened but, working with the Satake Centre for Grain Process Engineering at UMIST, Manchester, I was able to get some scanning electron images of ancient carbonised grain from a neolithic site in Scotland. The SEM images below were taken to accompany our funding applications and they were not originally intended for publication, but I think enough time has passed for me to now put them up on my blog and share them. The SEM work was done by a brewing research student. I am sorry to say I don't know her name and I did not get to meet her. I was given six tiny carbonised grains from the thousands that had littered the floor of a 6000 year old, early neolithic rectangular timber building in Scotland. The building was destroyed by fire. Professor Ian Ralston, one of the original excavators, was kind enough to send me them. Three of the grains had missing embryos, visible with the naked aye and very clear under a normal microscope. One of the grains was examined using a scanning electron microscope and it shows the missing embryo, on the right, indicating that it has begun to germinate. More of the grains from the site would need to be examined, to identify how many had begun to germinate. If it turns out to be a high percentage, and if the grains are friable and poorly preserved, then this is a deliberate malting for the production of ale in neolithic Scotland. Several SEM images of the same grain were made. 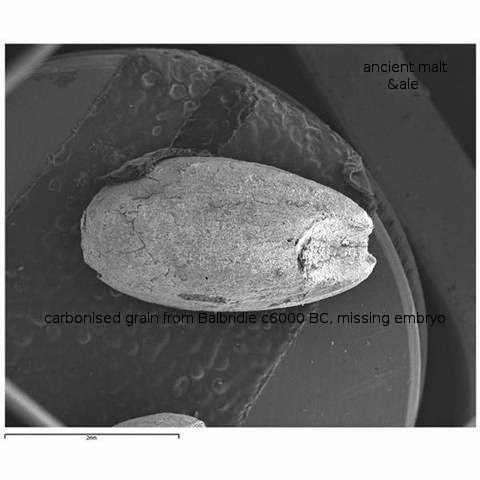 The image below shows that the endosperm of the grain has been badly damaged by the fire. But it is possible to just about see the aleurone layer, beneath the husk. Moving in closer to see the detail of the husk, we were very surprised indeed to see that the aleurone layer, that special layer of cells that kick starts the germination process, is visible, intact and well preserved. The husk has begun to be broken down by other enzymes, as can be seen in the bottom left of the image, and the grain was friable and fragile. All these are good indications of being malted. This final image of that little carbonised grain show how well the individual cells of the aleurone layer have been preserved. They look rather like sponges, and some appear to have been activated. The more you look at this image, the more detail you can see. It is possible to make out erosion pits, beneath the individual aleurone layer cells, that indicate that the enzymes have begun to hydrolyse starch into sugars. This is my favourite SEM image of an ancient grain. I think it would be a very good research project for someone to look at ancient carbonised grain from as many sites as possible. Changes in the aleurone layer cells and degradation of the husk might prove to be important criteria for the identification of malt. supplementary notes: 3rd March 2015 see here for the full details and the academic reference. Some carbonised grains were found at Nevali Cori, a site not far from the Euphrates river. Here are some extracts from the botanical report, which describes a 'roasting pit area' and carbonised grain that appears to have missing embryos. Could this grain be malted? In an Iron Age context, it would probably be described as malt by archaeobotanists. When grain like this, damaged and with missing embryos, is found in a pre pottery neolithic or Bronze age context, an interpretation of "malt" is considered 'controversial and speculative. I wonder why. The drawings of grain and extracts below can be found towards the end of the document. I welcome comments and discussion about this, and the idea that missing embryos in carbonised grain indicates that it has been malted. The site: Nevali Çori (NÇ) is located near the Turkish town of Urfa (37°60'N, 38°70'E, 490 m above sea level) on the slope of a Euphrates side valley. The 14C analyses, only available from the early levels, provided dates of ca. 8400 BC (calibrated). The settlement was occupied from the Early PPNB to the early Bronze Age (Hauptmann 1984, 1987, 1988, 1997). The PPNB layers included stone houses and a temple building of around 200 m2. On the slope in front of the houses a 'roasting-pit area' was found with a number of hearths in close proximity to each other. Most of these hearths were in use during the earliest phases. I removed the above comment because it seemed to be spam, advertising, not relevant to the blog.